Major League Gaming, MLG for short, is a company that hosts competitive gaming tournaments around the United States, and online. These are not small affairs. Its Pro Circuit stops in major cities attract hundreds of players from around the world, thousands of on-site spectators, and hundreds of thousands of concurrent viewers online. Usually, the company offers a free, live, digital stream for its events. This allows anyone to tune in, provided they put up with periodic ads, to the festivities. But the company recently opened a new chapter: instead of hosting a massive event, where spectators could buy a pass and hang out on site, MLG turned its New York office into a studio, flew in top pro Starcraft 2 players from around the world, held a star-studded tournament, and charged people for the privilege of watching the digital stream. Instead of providing a low quality, free stream of the games, MLG made the whole weekend pay per view. MLG’s offer was simple: pay $20, and watch the games live, or wait a week for the recorded clips to become free. 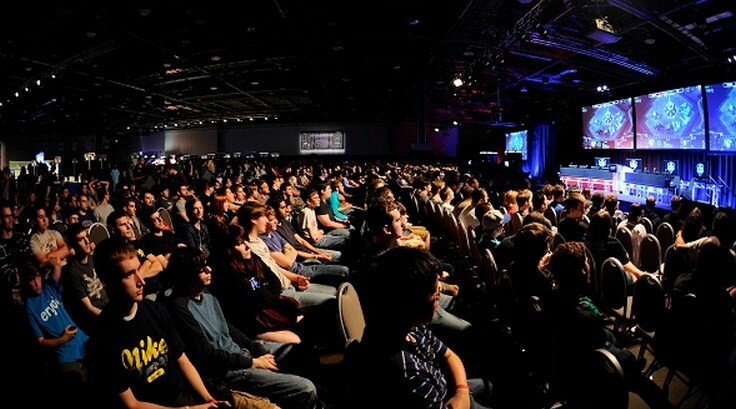 The move caused huge ripples in the competitive gaming world, with some fans bitching viciously about the requirement to pay, and a somewhat vocal minority pointing out that $20 for a full weekend’s entertainment was not too exorbitant a price. So, at least according to the man in charge, the pay per view experiment worked, and MLG will, he says, hold more similar events. All of this happened some time past, so why bring it to you now? Here’s why: it was filed with the SEC yesterday that MLG has raised another round of cash, this time over $11 million, bringing the total capital to raised around $70 million total. “Well, we had planned to do this this year, um, a little bit differently, we were looking at doing the arena the physical concept of building out a studio, building it possibly in Columbus Ohio, we had [even] secured some real estate. We’re looking at building that out, but, um, something, everything came along a little bit quicker than we planned, and, um, we moved everything up. And the reason that we moved everything up was that we’ve been doing this for a while, as everyone knows, we’ve invested a lot, in the space, and we’ve had a lot of growth and excitement, but the question of whether or not this idea had wings and could actually work needed to be answered a little bit sooner than originally planned. So, knowing what we knew, we sat down, had a long conversation with some of the people that I work with [lists names], [and we said] let’s just find out. Of course, the bolding is my own. From my perspective, here’s what went down with MLG thus far this year: MLG needed another round of cash to execute its 2012 plans to their fullest. Its investors were skittish about putting more cash into MLG with only its classic business model in place (huge events with sponsors kicking in dollars to advertise to the coveted young male demographic), so the company needed to show that it had other ways of making money. Enter the idea of paid-only events. As Sundance said, ‘something came along a little bit quicker than planned.’ I take this as the need to prove to investors that MLG is a viable business, or that the company just needed to raise sooner than they expected. This led to the company needing to prove that its core idea ‘had wings.’ I take Sundance to mean by that statement: ‘will people pay for what we are providing?’ So, the company went ‘all in,’ to see what would happen. That they transformed their own office into a studio for the event was likely no accident. I would bet that MLG was looking to run the event at the highest level it could, at the lowest cost possible. Therefore, by shaving some some expense by hosting the event themselves, they could provide the same value for viewers, and show a profit, which it could take to investors as proof that competitive gaming is no fantasy. And, two weeks after the event was a success, the investment cleared. Good on MLG for jumping off the cliff to prove their vision. Good on the community for, unwittingly, showing investors that MLG has legs to run. And good on esports, for being awesome. I tried to get Sundance on the phone for comment on this post, but even working through a friend who knows us both, couldn’t. Oh, and just for fun, according to MLG’s SEC filing, it has revenues of between $5 and $25 million a year.